Several years in the making, this truly once in a lifetime vertical traced the arc of Giulio Salvioni’s Brunello di Montalcino back to the inaugural 1985 vintage. From the outset, Salvioni’s Brunellos attracted a great deal of acclaim, and with good reason. The early vintages remain monuments to the potential of Sangiovese in Montalcino, while many of the more recent vintages are contemporary masterpieces. A few members of the local press were also in attendance, including Andrea Gabbrielli, who is credited as the first Italian critic to recognize the quality of Salvioni Brunello after he gave the 1985 the coveted Tre Bicchieri award at Gambero Rosso. I sat in the corner and tried to soak in as much as possible (information, not wine!) All of the bottles were sourced from the Salvionis’ personal cellar. 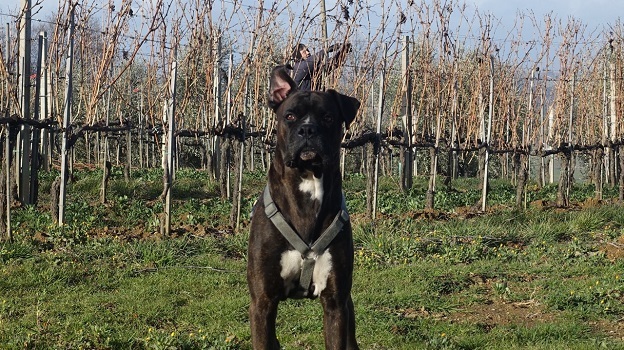 The Salvioni family and their wines embody the essence of what makes artisan Brunello so special. Totally hand made, from the vineyard to the cellar and into the bottle, these wines have much more in common with the great reds of Piedmont and Burgundy than they do with the vast majority of what comes out of Montalcino these days. Up until a few years ago, labeling was still done by hand because the cellar was not equipped with power outlets that could handle modern equipment. Production is miniscule, which means bottles disappear from the market as quickly as they arrive. The early Salvioni Brunellos were made from the central part of the original vineyard, which measures about 2.5 hectares, all located around the main winery building. At the time, the land was planted mostly with olive trees and just a few vineyards. The first Salvioni wines were made with vines planted in the early 1980s. A devastating frost hit Tuscany in 1985, taking with it a large number of very old olive trees. 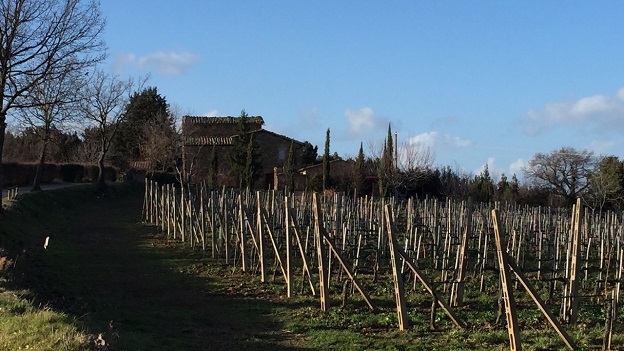 As a result, the Salvionis redeveloped their estate with more vineyards starting around 1987. In 2001, the Salvionis added a little more than a hectare of vineyards when new planting permits were granted across the region. Today, the total surface area of vineyards is just under four hectares. 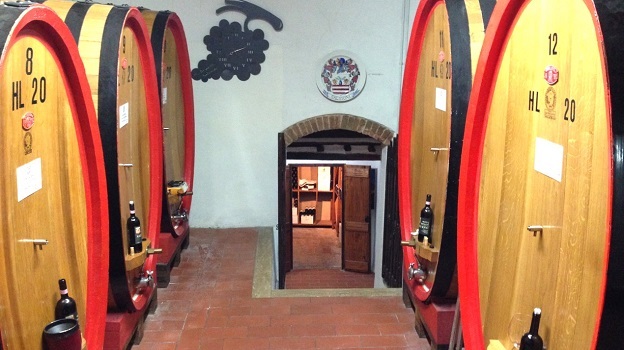 In most vintages Salvioni produces four casks of Brunello, which account for 12-13,000 bottles. 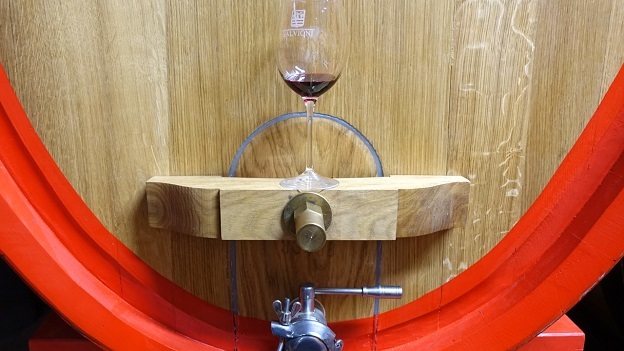 When quality is variable, one or more of those casks is bottled early and sold as Rosso, as was the case in 2009 and, more recently, 2011, when half of the production was declassified. 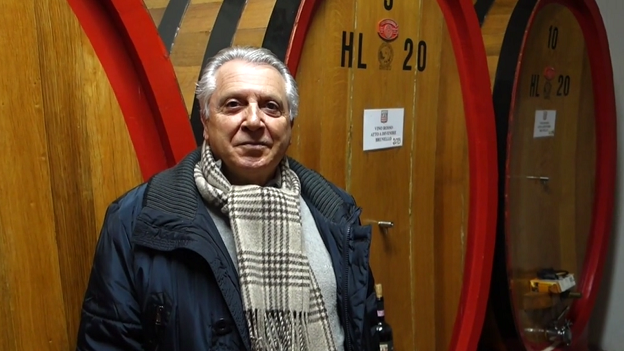 In exceptional cases, such as 2014, an entire vintage can be declassified to Rosso. Much more commonly, in top vintages there is no Rosso at all, as will be the case for both 2012 and 2013, where all of the wine will be bottled as Brunello. Even today, the wines in cask are divided between two tiny, cramped cellars, one in the center of town and the other next to the vineyards. Alcoholic fermentation is done in steel, with natural techniques to control temperature. The fruit spends two to four weeks on the skins, depending on the vintage, with pumpovers only at the beginning of fermentation. Malolactic fermentations are always finished by the end of the year, usually in cask, but the malos can be done in steel if they are fast. The Brunello spends four years in cask and is bottled with no fining or filtration. According to Pagli, the biggest change at Salvioni over the last thirty years has been the greater age of the vineyards. “This is quite possibly the simplest, most basic cellar I work in,” he told me. Despite their considerable successes, Salvioni remains very much a down to earth, family-run property. Giulio and Mirella Salvioni have now passed the torch to their children, Alessia and David, although they both still have so much to say, especially about the estate’s early days and a time when great personal sacrifices were necessary to pursue the path of quality. As this tasting amply proves, the results of thirty years of hard work are in the glass. The 2011 Brunello di Montalcino is supple, open-knit and quite pretty. Sweet red cherry, plum, hard candy and white flowers are all super-expressive. This is an especially lifted, gracious Brunello from Salvioni. In 2011, it is the wine's silkiness and inner perfume that stand out. The 2011 is a gorgeous wine to drink now and over the next decade or so, but then again, these wines have a way of exceeding expectations in terms of their aging potential. One of the many highlights in this vertical, the 2010 Brunello di Montalcino is exceptionally beautiful. Today, the 2010 comes across as refined and polished, with veins of bright acidity that give the wines its sense of energy, drive and polish. Over the last few months, the 2010 has begun to close in on itself. I can't say that is surprising given how much stuffing there is. Readers lucky enough to own the 2010 are in for a real treat. When all is said and done, the 2010 is profound and riveting in every way. The 2009 Brunello di Montalcino is one of the most immediate and one-dimensional wines in this tasting. There is good depth and intensity in the glass, but much less of the layered quality and nuance of the very best years. Still, the 2009 remains young, with little in the way of aromatic development. All things considered, the 2009 is an excellent wine for satisfying the Salvioni urge while some of the more important surrounding vintages continue to develop in the cellar. Salvioni's 2008 Brunello di Montalcino speaks to finesse above all else. Sensual, ever-changing aromatics draw the taster in. The 2008 is gracious and lifted on the palate, yet also possesses a remarkable sense of understated richness. Just starting to enter the early part of its maturity, the 2008 also has more than enough depth to drink well for another two decades or so. Dark, rich and enveloping, the 2007 Brunello di Montalcino races across the palate with stunning depth and richness. The flamboyance and opulence of the year come through loud and clear. Given its breadth and pure intensity, the 2007 is likely to drink well for quite some time. On this night, it is absolutely gorgeous. Every bit as monumental as I had hoped, Salvioni's 2006 Brunello di Montalcino is rich, towering and explosive, with fabulous depth and intensity. Dark cherry, smoke, spice, leather and plum gradually open up in a powerful Brunello that still needs time to soften. Epic in its dimension, the 2006 remains one of the very best vintages ever made here. The 2005 Brunello di Montalcino is one of the few disappointments in this vertical. The aromatics are quite forward, yet there is plenty of richness and intensity on the palate, which suggests the wine is not developing evenly. A bottle tasted a year ago was slightly more convincing. I would not wait too long on the 2005. Far more captivating, the 2004 Brunello di Montalcino appears to have barely budged since it was released a few years back. Stylistically, the 2004 remains one of the more mid-weight vintages at Salvioni, yet it is so finessed. Remarkably fresh and nuanced, the 2004 has all the qualities that made it so appealing when it was a young wine. Everything is simply in the right place. What a gorgeous wine this is. Another of the real surprises in this tasting, the 2003 Brunello di Montalcino is absolutely stellar. Inky and dense on the palate, the 2003 possesses stunning richness and intensity. Black cherry, plum, smoke, licorice and spice are all fused together. The 2003 is a decidedly dense and super-concentrated wine, yet it has aged exceptionally well while retaining quite a bit of freshness considering the scorching hot weather that year. Although the 2003 can't quite reach the level of the very best wines made here, it is in the group of vintages that lie just below. The 2001 Brunello di Montalcino is just beginning to show the first signs of aromatic development, yet it remains deep, dense and concentrated on the palate. Readers who own the 2001 are in for a real treat, as it is truly spectacular today. Pomegranate, red cherry jam, blood orange and dark spice meld into the unctuous, deep finish in a superb Brunello that is both refined and powerful. Salvioni's 2000 Brunello di Montalcino is a gorgeous wine for drinking today. Sweet, generous and inviting, the 2000 offers a compelling interplay of nuanced aromatics and soft, pliant fruit, all in a mid-weight style that is undeniably appealing. The 2000 is not a huge Brunello, but it is striking, super-expressive and very complete today. Sweet red cherry, iron, crushed flowers and tobacco add the closing shades of nuance. The 1999 Brunello di Montalcino is exceptional. One of the most dazzling, captivating wines in this vertical, the 1999 possesses fabulous textural depth allied to energy. The aromatics are just beginning to show the first signs of tertiary nuance, while the vibrant, saline finish suggests the 1999 still has plenty to say. Readers lucky enough to own the 1999 can look forward to another decade-plus of superb drinking. The 1998 Brunello di Montalcino is a heady, exotic wine. Truffles, spices, blood orange and cloves lift from the glass. Inviting and pliant throughout, the 1998 is stunningly beautiful for many reasons, not the least of which are its freshness and nuance. The 1998 is one of the most rewarding wines in this vertical as it overachieves the year by a wide margin. How I would love to own a few bottles. Total production was around 7,000 bottles. Salvioni’s 1997 Brunello di Montalcino is deep, unctuous and super-concentrated. For a wine of its size, ripeness and vintage, the 1997 has aged exceptionally well. The bold, flamboyant style will appeal most to readers who enjoy opulent wines. At nearly twenty years of age, the 1997 is stunningly beautiful. The 1997 is at times a bit heavy and one dimensional, but it is in a great shape today, which is pretty much the highest compliment I can pay it. The 1996 Brunello di Montalcino is another wine that is absolutely breathtaking. In this vertical, the 1996 reminds me of the 2010 because of its captivating aromatics, precision and chiseled, articulate personality. Sweet black cherries, lavender, mint and sweet spices are all laced together. Exceptionally beautiful and vivid, the 1996 will drink well for at least another decade. When it was first released, the 1996 was passed over in favor of the 1995 and 1997. Today, though, the 1996 is having its justly deserved day in the sun. What a gorgeous wine it is. With the added perspective that this retrospective affords, the only period in which quality drops is approximately between 1990 and 1995, which are the first years that incorporate young vine fruit from vines that were planted beginning in 1987. Interestingly, quality shoots right back up with the 1996, where it has pretty much stayed since then. The 1995 Brunello di Montalcino is the first wine in this tasting that is fully mature, although it has enough brightness and depth to drink well for at least another few years. Sweet tobacco, licorice, anise, game, and dried cherries add nuance on the aromatic, perfumed finish. At this point, there is not much upside from cellaring bottles further. "We had quite a bit of rain in August that year. When we returned to Montalcino after vacation, on September 2, the grapes were still green. From there, conditions improved and we picked on the 20th. Those who picked earlier weren't so lucky," Giulio Salvioni told me. 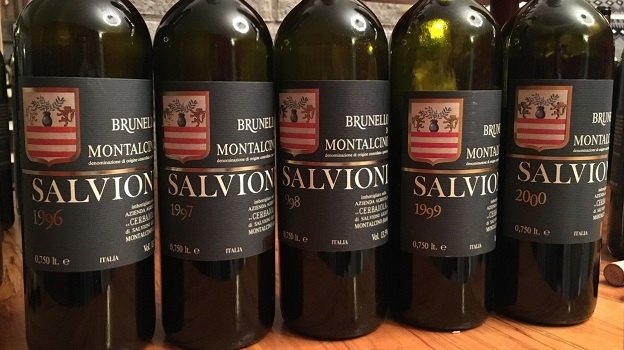 From a vintage considered inferior to 1995, Salvioni’s 1994 Brunello di Montalcino has held up beautifully. It, too, is fully mature, but it also has striking depth, especially for a wine of its age. Smoke, tobacco, black cherries, game and licorice add nuance to the dark, intense fruit. The 1994 is wild and a bit rough around the edges, but it has stood the test of time very nicely. The 1993 Brunello di Montalcino is an attractive, mid-weight wine that is peaking or slightly past peak. Dried red cherry, iron, smoke, white pepper, roasted coffee beans and dried flowers are some of the signatures. Any remaining bottles need to be finished. Overall, this is one of the more mid-weight, lithe wines of the tasting. A pleasant and unexpected surprise, the 1992 Brunello di Montalcino is the most satisfying of the wines of the early 1990s. Although fully mature, the 1992 has aged gracefully yet it also has enough depth to drink well for at least a few more years. Roasted coffee beans, spices, dark cherries and leather are some of the scents that lift from the glass. Any remaining bottles need to be finished off sooner rather than later. This is another more than respectable effort in a dismal vintage. The 1991 Brunello di Montalcino, from one of the most challenging vintages of the last thirty years, is now fully mature and past peak. Salvioni’s 1990 Brunello di Montalcino is translucent and fully mature, even if it still has lovely depth. Now slightly volatile and ethereal, the 1990 has seen better days. The 1989 Brunello di Montalcino is dense, layered and nuanced, with striking depth for a wine from this era at Salvioni. The 1989 is now fully mature, but it has aged gracefully. Scents of dried cherry, anise and dried rose petal leave a lasting impression. The 1989 is a decidedly light, almost Pinot-like Brunello endowed with remarkable finesse in a vintage that is remembered as one of the most difficult in Montalcino of the last thirty years. 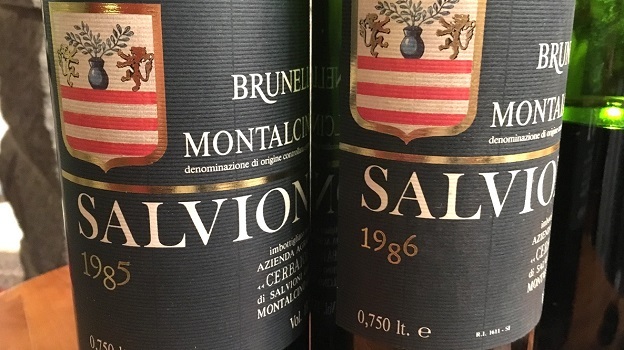 Salvioni's 1988 Brunello di Montalcino has aged well and offers good immediacy, but it also comes across as a bit one-dimensional. Black cherry and plum notes give the 1988 much of its dark, powerful personality. The 1987 Brunello di Montalcino is one of the most impressive of the 1980s wines at Salvioni. Beams of underlying salinity and acidity give the 1987 noticeable freshness. Red cherry jam, anise, crushed flowers and licorice add nuance, but the 1987 is mostly remarkable for its freshness and exceptional balance. Even today, the 1987 retains surprising acidity to balance the fruit and overall structure. In a word: magnificent! As hard as it is to believe, the 1986 Brunello di Montalcino is even better than the 1987. Surprisingly exuberant and intense, especially for a wine of its age, the 1986 has it all. Dark red cherry, plum, spice and leather add multiple shades of dimension in a vivid, outrageously beautiful Brunello that speaks to the potential of Montalcino. The pure intensity of the fruit is simply remarkable. 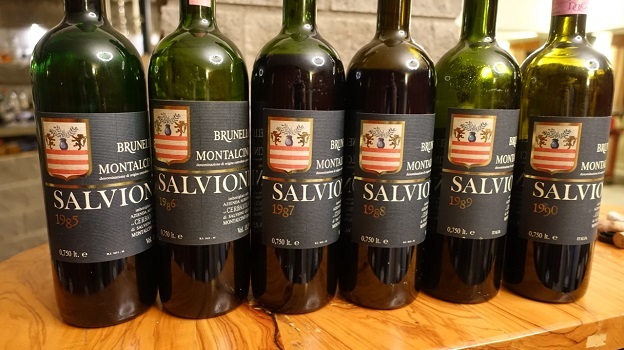 Giulio Salvioni's first Brunello di Montalcino, the 1985, confirms its status as one of the finest wines of its era. Eucalyptus, mint, dark cherries, licorice and spices wrap around a core of liqueur-like fruit. Sweet, perfumed and super expressive, the 1985 is absolutely delicious today. Production was just 2,400 bottles. Nineteen eighty-five is also remembered for a severe January frost that froze the Arno River in Florence and wiped out a massive number of olive trees throughout Tuscany. At Salvioni, 1,200 old olive trees were lost. "It is the vintage that literally changed the landscape of Tuscany," adds Giulio Salvioni in reference to the loss of so many centuries-old olive trees.